In late 2013, I was lucky enough to be invited to a lone chocolate dessert bar in Burwood, called, The Choc Pot. Little did I know I would experience the most exquisite chocolate desserts and drinks I could ever imagine. 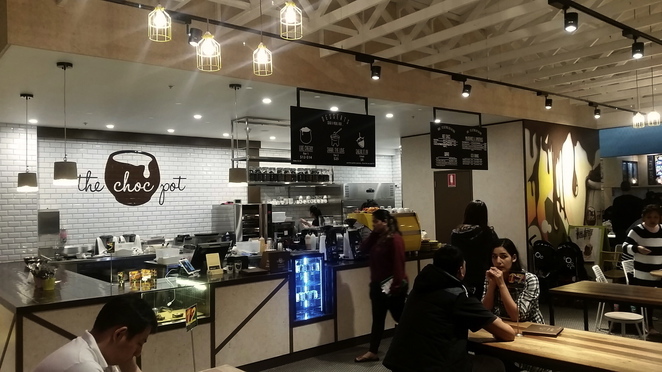 Look ahead to 2015 and the dynamic-duo that is Ash and Deej are announcing the thrilling news that a second store has found a home in The District, the new dining precinct at the Chatswood Interchange on the North Shore. Their new open-plan location amidst the bustling atmosphere of The District is welcoming, inviting and is decked out in their signature quirky-industrial style. 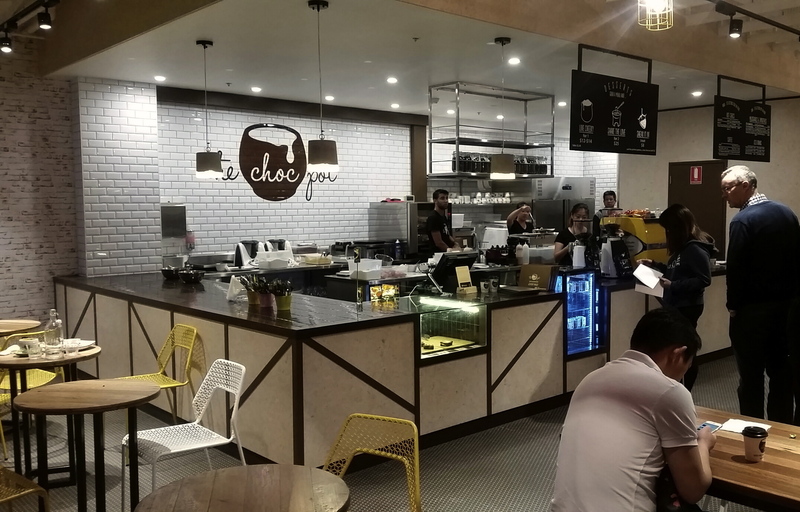 I was not surprised to see that the original concept had been so successful that they had decided to branch out and share their "live cheeky" motto and chocolate delights with even more lucky diners. The Choc Pot was a passion-project for the owners, Ash and Deej, who before embarking on this wondrous adventure, were on vastly less-chocolatey paths. We can all be grateful that they decided to take a flying leap of faith into the divine depths of devilish desserts. The Choc Pot prides itself on hand-crafting innovative and utterly enticing desserts in-house, using only the highest quality ingredients, such as Callebaut Chocolate, fresh Jersey milk, Billington's sugar and free-range eggs to name but a few. 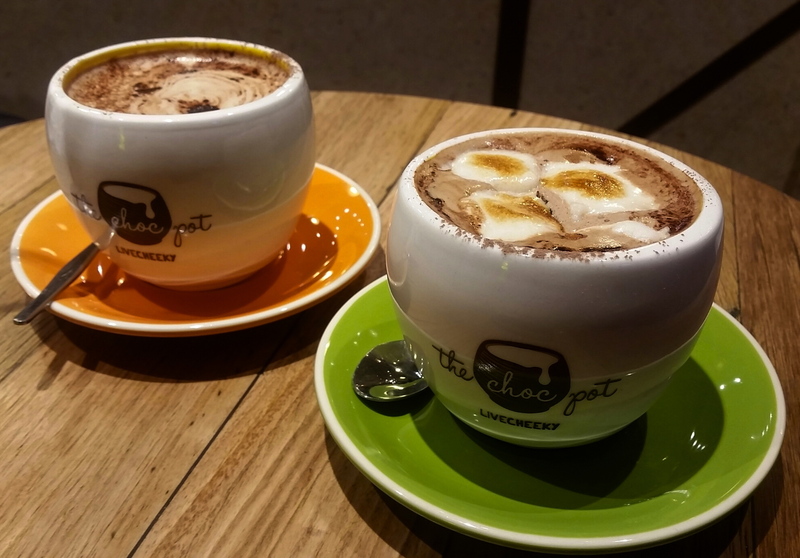 They whip up their own marshmallows, honeycomb and many more mouth-watering bites. The proof is literally in the pudding when tasting these tantalising treats, it is abundantly clear that when prime ingredients and pure talent come together, magic happens. 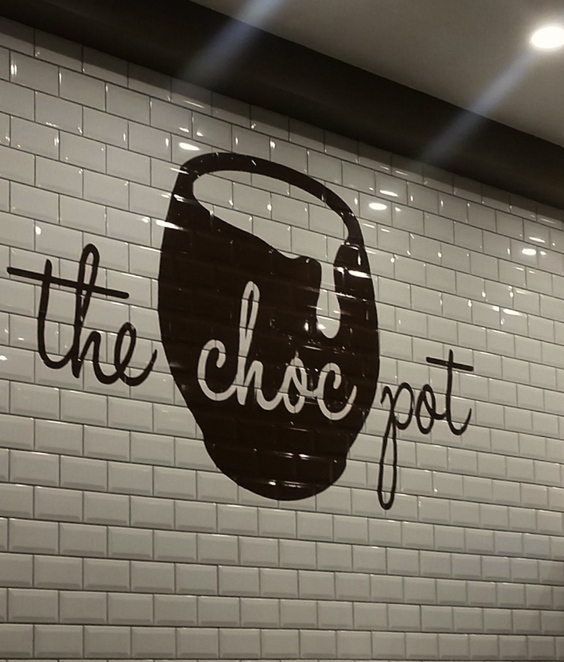 The menu at The Choc Pot has its tried and true favourite treats such as the namesake, The Choc Pot chocolate fondant, as well as, Mr Souff chocolate soufflé, Hot Fudge Brownie Sundae, Double Dip Fondue for Two, Waffles with a variety of decadent toppings and Crêpes with luscious fillings. The Choc Pot also whips up a Dessert of the Month to continue to bring something fresh and exciting to our tastebuds, so what better excuse to make a date with The Choc Pot once a month. Take your pick from the masterful milkshake range, which includes the Cranky Pants Salted Caramel milkshake and the Choc Peanut Butter milkshake, or a sip from the indulgent hot chocolate range which includes TCP specialities, the S'mores Hot Chocolate and the Red Velvet Hot Chocolate. If you need a bit of a reprieve from the creamy creations, there is a variety of black, white and green teas served hot by the pot to perfectly accompany your dessert, or for something with a refreshing chill, you can grab a fruity Ice Smasher or silky smoothie. 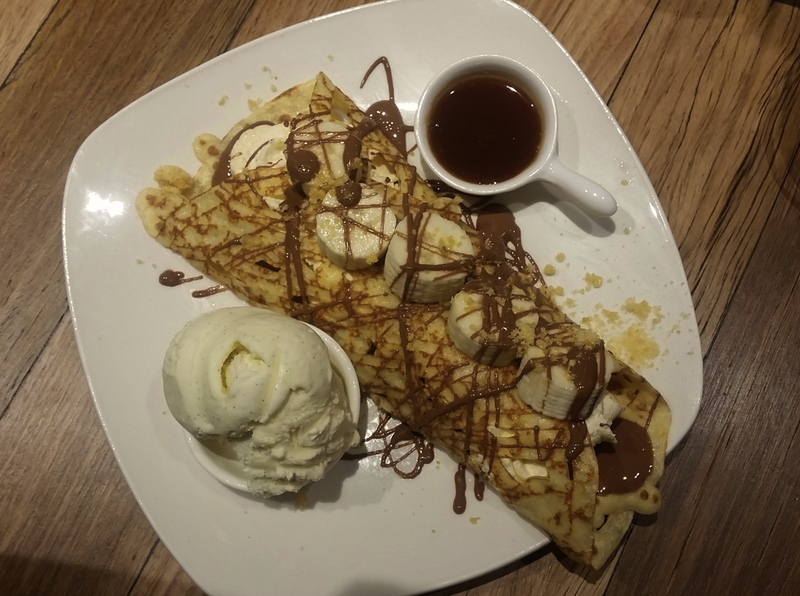 For this particular visit I had set my sights on The Splits; banana and fresh whipped cream, wrapped in a made-to-order crepe, enrobed in melted Belgian milk chocolate, a sprinkling of crunchy house-made honeycomb and a side of sticky, salty, sweet Cranky Pants Salted Caramel. I'd say it's the best dessert I've ever eaten, but I feel compelled to say that about every dessert that I consume at The Choc Pot, they are honestly the best chocolate desserts you can find. My partner was captivated by the Super Terrific Happytime and it provided exactly what its name promised. 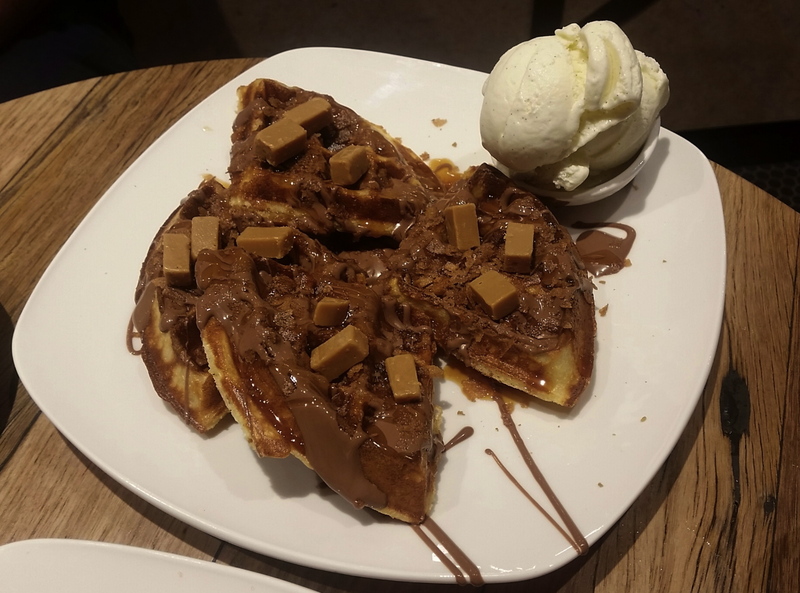 A freshly cooked 'crispy on the outside, fluffy on the inside' waffle, drizzled generously with Cranky Pants Salted Caramel and melted Belgian milk chocolate, topped with salted caramel fudge chunks and crispy wafer pieces. It was so satisfying, especially with the side of ice-cream you can add to any order. To counteract the rainy old day outside, we had some hot beverages to accompany our desserts. A S'mores Hot Chocolate topped with house-made marshmallow and a Cranky Pants Salted Caramel Hot Chocolate. Both taste very much as good as they sound, nothing less than creamy excellence to knock your socks off. 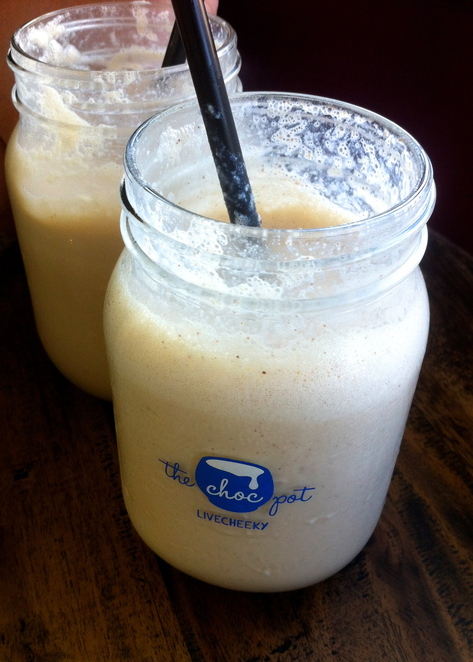 Be sure to capture your experiences and connect with The Choc Pot via facebook, Twitter and Instagram, as they run competitions and give-aways regularly. So now that there is another store to visit to satisfy a whole new area of dessert-lovers, you better get there quick to find out what everyone is talking about. The Choc Pot is a warm and inviting dessert destination, with attentive and friendly staff putting the cherry on top of this truly tasty chocolate experience.